From a sheer, subtle wash to a full, flawless finish, your ideal coverage is just a few drops away with this silky-smooth foundation from NYX Professional Makeup. With 24 shades – from ‘Pale’ to ‘Deep Espresso’ – you can find the perfect velvety matte for your complexion and fine-tune your coverage with the convenient dropper-tipped applicator. The perfect multi-tasking base, NYX Professional Makeup’s Total Control Drop Foundation allows you to achieve just the coverage you want – even if your look changes every day. From a sheer wash of subtle colour to a full-on, flawless finish, this foundation features a super-convenient dropper-tipped applicator that lets you add coverage drop by drop. Offering a sublime, velvety-smooth matte finish, there are 24 shades to help you match your complexion perfectly. Beginning with fair hues like ‘Pale’ and ‘Alabaster’ and developing into deeper ‘Chestnut’ and ‘Deep Espresso’, via mid-toned ‘Classic Tan’ and ‘Golden’, there’s sure to be one to suit your skin tone. 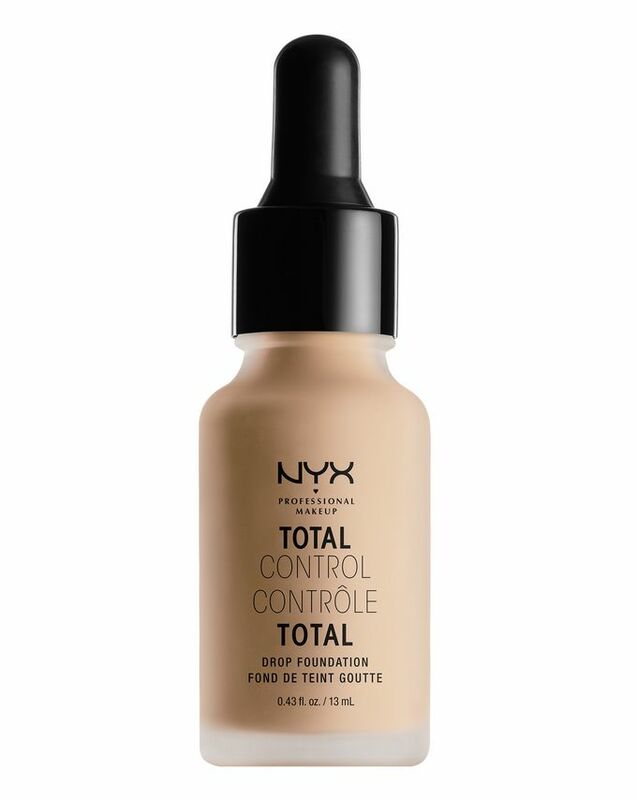 Apply drops to face (more drops = more coverage) then buff in with fingers or NYX Professional Makeup’s brilliant Total Control Drop Foundation Brush for a seriously smooth finish. Best foundation I’ve ever used in my life it’s buildable and suits my lifestyle, it feels like you are wearing nothing on your skin, blends effortlessly and is great for huge pore sufferers like me. This product provides great coverage and leaves a beautiful matte finish. Don't waste your money. I have combination skin, this is patchy and sticks to 'dry'skin even after exfoliation. It's patchy and the coverage build is rubbish. Will stick with my regular foundation in future. I like the feel of it, goes well with a brush. Medium lasting finish, nice for the winter. However, if you get it on your clothes (like reds or blacks) boi does it NOT come out. It's like bleach. I've done all the things to get it out, from dabbing it with a towel to washing it, to shaving cream on it! Bought the lightest shade to blend with my urban decay all nighter foundation that oxides a lot. They blend very well and for that purpose I'm satisfied. But this product alone it terrible, doesn't work for anyone with large pores or impurities as it cracks up around pimples and wont cover pores, it's not at all build-able as others have said. Great lightweight foundation but when I started building up coverage it turned orangey and doesn’t look right at all. After watching a swatch video on @kristenxleanne 's instagram I was hooked and couldn't wait for this to be available in the UK. Not at all disappointed, the formula is light as air and is a nice light coverage foundation. As someone who struggles to find a match for my skin tone, the light ivory blew me away by its versatility and the way it blended into my skin. Deffo my new go to. Coverage definitely isn't 'buildable' and is far too watery. It does last all day but I won't repurchase. Very lightweight and buildable. I love it so much. I swear by this foundation! I have very dry and sensitive skin it’s perfect for everyday and is light weight and very good to build up. 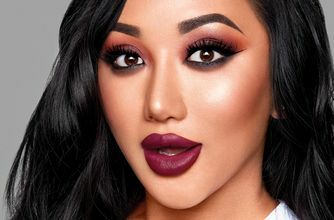 Coverage is outstanding and long lasting. I love this foundation, and I have tried MANY cult foundations over the years, ranging from drugstore to La Mer, and everything in between. This is probably my favourite foundation. It gives flawless, lightweight coverage, and lasts practically all day long. The trick is to use it with the primer, apply it with a beauty blender, and set it with a setting powder. I will purchase this over and over again, as for the first time in my life, I've gotten comments that my skin looks flawless and like glass. And trust me, my skin is far from flawless. I really like this foundation. It’s a great colour match, even though I have quite pale cool-toned skin! I have dry skin and I don’t find that it clings to any dry patches and I think the coverage is great. The only thing I don’t like is that the bottle is quite small for the price you pay. I bought the foundation and the brush together and *sigh* just a complete failure. I have combo skin leaning on dry but I always moisturise before applying foundation. This product is extremely liquidy, which is fine if it didn't look like I was putting coloured dry oil on my face. Streaky, patchy, clinging to "dry" skin that I can assure you were not there. Overall it was a mess. Not only that but it doesn't exactly dry down fast, and the bottle is TINY. I wouldn't even say that it is particularly full coverage so if you like that then watch this foundation finish fast. Apart from that, the colour options are great. I got the brush and the foundation together and it's the worst foundation I've ever used. As soon as you apply it the feeling is greasy and horrible and it immediately sinks into the cracks in your skin so you look like a dry desert. Well, I like it and I think it's worth the money because I like the coverage and the shade because I got the lightest, but I'm not sure if this is related to it but since I started using it my skin on my nose and cheeks have been so dry. It might not be to do with it but it's only been dry since I started using this foundation. Anyone else has this problem? Not worth the money. It doesn't cover and it's super watery. I get mixed results with this depending on how my skin is behaving. When I'm having a good day, it feels lightweight and is long lasting. On a bad day, if I've got any dry skin whatsoever then it just looks awful. It tends to break up at the corners of my mouth and around my nose too. Probably works much better on an oily skin. Amazing full coverage water weight foundation. Affordable and a must have makeup product. I actually ordered 2 colours in this to mix and I was pleasantly surprised by the colours and coverage of this foundation especially as I have very oily skin and I work in 30 degrees heat for 10 hours a day. Stayed matte all day. Also I know a lot of people have commented on the size of the bottle HOWEVER I usually pay in the region of £30 for my regular Estée Lauder foundation in just one shade. However with ordering 2 shades I can custom mix this depending on how tanned I am and it's still cheaper than the Estée. The only downside to this is that it's VERY matte, and I was sort of hoping it might be slightly more dewy finish! Just personal preference really but I feel that flat matte is now just for walls and not for faces in 2017. Hopefully I can get the look I want from just applying a different primer and using the dewy setting spray to finish it off! Overall would definitely recommend, my first NYX purchase and I'm very pleased with it. The lightest shade is like the concealer, too yellow. and on the skin, it's a mess.